In itself this is a relatively minor and trivial matter and I have no desire to waste police time. On the other hand this is not a precedent I am happy to set with my neighbour if I do nothing . I am also making one large presumption here. While away on holiday the neighbour chose to replace his old fence. Although we knew it would happen some time, it might have been a day , week or year. He did not tell us when he was doing this. We know the old fence was pulled down and due we think to a disagreement he had with his fencing builders , the fence was down leaving our two gardens connected openly at the back for around 5-7 days . A new fence was then erected and this was complete before we returned home. While checking the garden today I noticed that all my gardening tools have vanished. These were left in the garden in a small alleyway. A broom, spade and fork. All fairly new and decent quality. Probably worth £60 in total. That the neighbour will not take responsibility and replace these tools as it is his actions that can only have expedited their loss. With an erected fence there is no entry realistically into the garden. Firstly I have checked that there is no other explanation for their disappearance. No one for example who was looking after the house has borrowed them. Do nothing and buy new ones. Report this to the local police and take their advice. However I am keen to not waste their time . Gothenburg is the second largest city in Sweden and the fifth largest in the Nordic countries. The population is around half a million and the city was founded in 1621. Gothenburg also has the largest university in Sweden with 60,000 students. Daylight cana last 18 hours in the summer and only 6.5 hours in December. When one arrives it seems a nice place with most hotels arranged around a central square with the Centraal Train Station on one side. 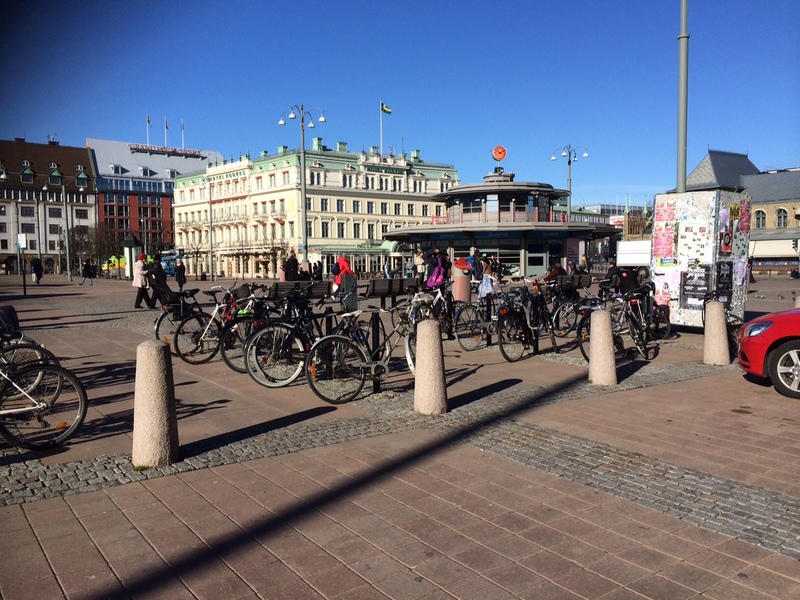 My impressions of Gothenburg were rather coloured by the huge number of Eastern European immigrants begging in the square rattling their plastic cups in one’s face and trying to sell a magazine called ” Sofia ” which made me presume they were Bulgarian. They were hunting in packs and although not frightening to me, I could see that to others they could be persuaded as being so. In the evnings they were inside the train station taking up most of the chairs and seats and in the day they operated in and around the square. A head ” beggar” a large woman sat on a bench barking out orders in a language that seemed alien to me. The city of Gothenburg portrays itself as “soft and more human” when dealing with poor EU migrants, local paper Göteborgs Posten wrote. But the situation is far from black and white. In 2010 Gothenburg’s social services paid for 28 beggars to return home. In 2013 that number was 93. The largest increase of those sent home has been seen with beggars from Romania.Between 2010 and June of 2014, the Gothenburg paid to send home 135 Romanians. Norwegians came in second place, with 35 getting a free ticket home, and Bulgaria came in third with 23 beggars sent home. The police in Gothenburg suspect the begging is organised, however that doesn’t make it a crime. There’s a difference if relatives are collaborating or if someone forces poor people to beg and then takes the money. Several cases of human trafficking have been revealed in Stockholm where people have been brought to Sweden by criminal networks. 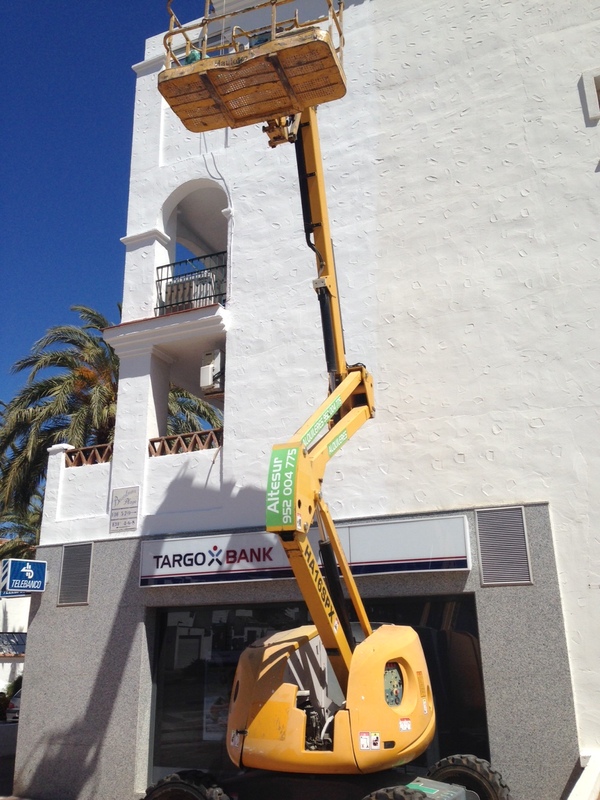 Disabled people and children are in special demand by the networks. 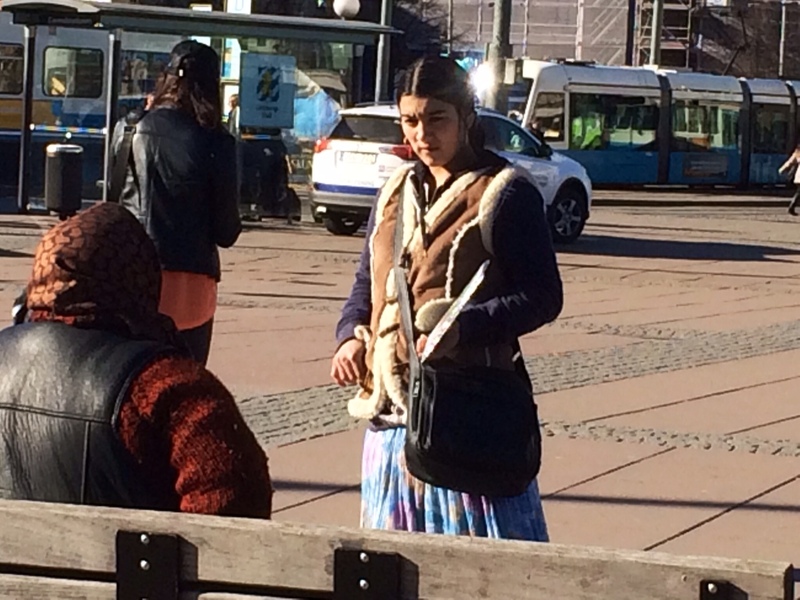 The Gothenburg police have not been able to clarify if there is someone in the background making money from the beggars in the city. In contrast the hotels are nice, comfortable and the staff ultra polite. The food is good, heavily fish-based. 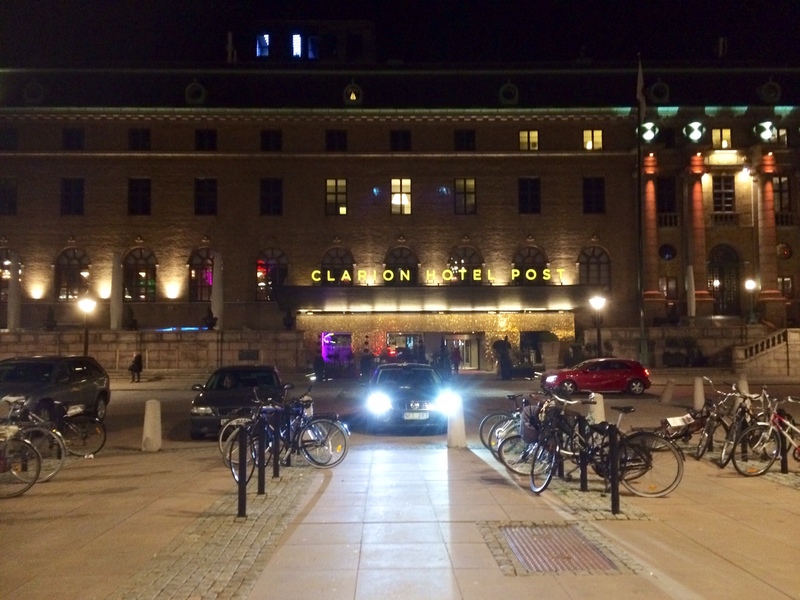 The affluence is obvious with hotels like the excellent Clarion Post having expensive Japanese Sushi restaurants. In the square one must avoid the trams if not the beggars as they take no prisoners and seemingly come from all directions. 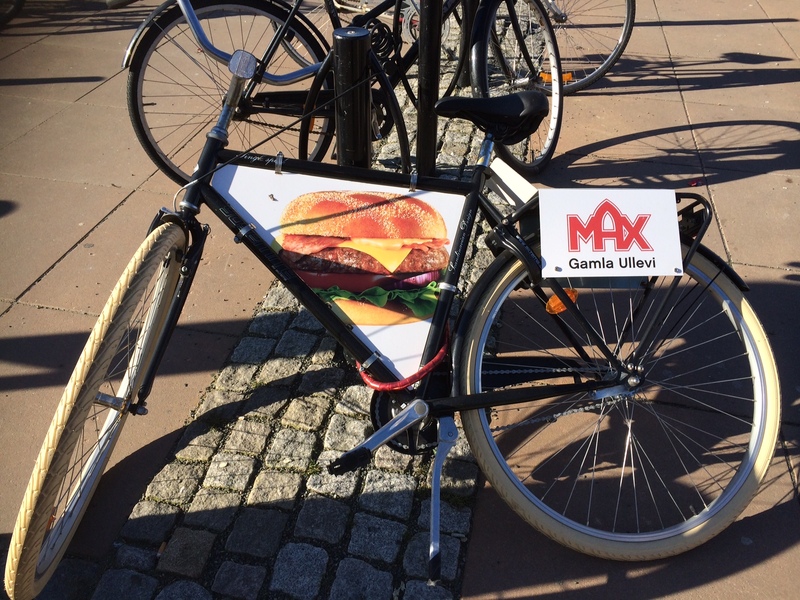 There is also an amusing angle with the emphasis in Sweden on living healthily, and thousands of bicycles in the square, but with some sponsored by burger companies. This seems a good city of not an exciting one. 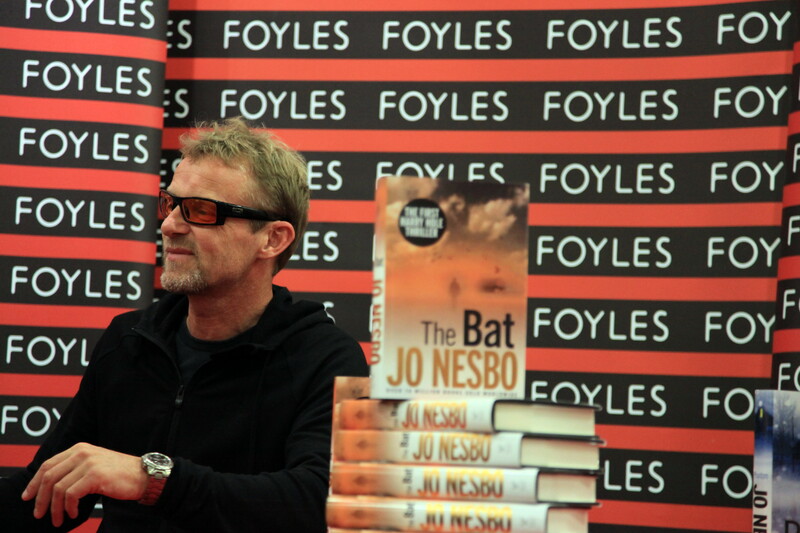 Jo Nesbo is one of the worlds leading authors. He writes norwegain crime novels about a detective Harry Hole ( pronounced Who Lay). Some of his descriptions of these crimes are graphic and frightening. Thus it was a pleasure to meet him at a book signing of his latest novel THE BAT. In fact this is the oldest book but it has only just been translated into English. Jo was not how I expected him to be but thats just my vivid imagination . Many thanks to Foyle’s for staging this. What was also nice was to see him then come in and have coffee and muffin in the Cafe there. The cafe can be highly recommended. An amusing moment though when someone wondered if Jo Nesbo was carrying a ” Leopold’s Apple” in his hand. 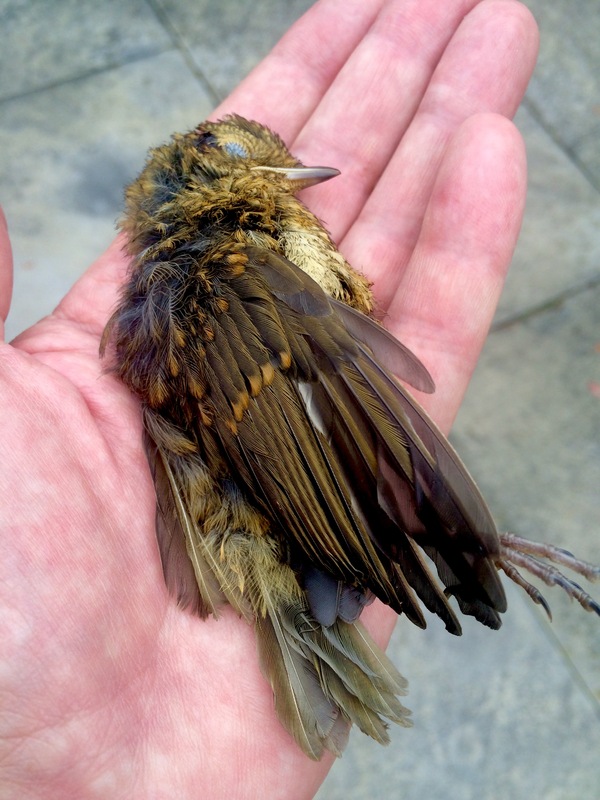 It turned out to be nothing more sinister than a chocolate muffin (presumably squirrelled away). I really have enjoyed my time in Saudi and find the people so pleasant but nothing surprises me here and that is the key to enjoying the country. This morning I was picked up at 6 am for a taxi ride to the airport. Simple. The first question was establishing which Jeddah airport. There are three all within a proximity. The first one would have been for Saudi Arabian Airlines flights which was 12 km, the second was for only the Saudi Royal family, this was about 25 km away and finally the last , third, and final airport which was for all foreign airlines 35 km away. I was fully prepared for plentiful discussions and debate with passport control and border agency equivalent staff at Jeddah, as that was my recollection from my last visit in 2008. Establishing beyond doubt that I did want to leave, that I had not and did not intend to commit any crime in KSA and to enquire as to exactly what I had been doing for the few days of my stay. My paranoia was misplaced. My interview with passport control was over in 5 seconds and the stamp provided and no-one else expressed any interest in what I was doing in Saudi Arabia. As I sit here in the lounge watching the sun rise higher in the sky and trying to look out of the windows ( not so easy as they are all covered in sand and dust), it does seem that KSA has changed for the better over the last 4 years and I would really look forward to the opportunity to return here one day not too soon. Two of my recent visitors have been from Iceland and there is a phenomenon that is growing fast, that of the UK selling large quantities of Scandinavian and Icelandic crime fiction. The great Stieg Larsson started things off with maybe the best trilogy that will ever be written about the Girl with The Dragon Tattoo. Jo Nesbo continued things along with a series of superb novels and now an Icelandic authoress, Yrsa Siguradottir continues on. Currently I am reading the second novel from her, and having read her most recent novel first, am working backwards. Her writing cannot be praised too highly. Not only does she convey an extraordinary complexity of plot but she captures the characters so well. Surprisingly the books are also humourous, with some descriptions of her secretary/assistant Bella, being described as a Gothic tugboat, opening the mind to what exactly she looks like. The other people who deserve praise are the translators of all these novels as they read in English as fluently as one imagines they would having been written by a native english speaker. 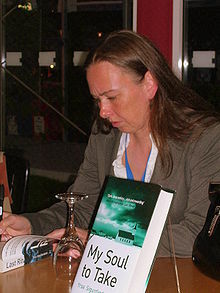 The current book is called (English translation by Philip Roughton, Ashes to Dust, UK:July 2010).